With the holiday season in full swing, traveling to be with family and friends is a main priority for many of us. However, many seniors have mobility issues that add stress to even the shortest trip. But if a little extra planning, time and care is taken, our older loved ones can join in the festivities, too. Annual trips with older loved ones can be a great way to be together during the holidays, or any time of year. 1. Should they make the trip in the first place? – Has the primary care doctor signed off on the trip? Would the trip cause too much stress on the senior or even endanger their health? Having a doctor clear them for travel should be the first step taken. 2. Make plans for special needs – For those in a wheelchair, reaching out to the airline beforehand can save time and worry. Don’t forget about security checkpoints, too. It might be easy for you to take off shoes or a belt, but it can be more difficult for those with mobility issues. If your loved one is staying in a hotel, double check that the rooms are ADA compliant and that appropriate transportation is available at the airport. 3. Make sure carry on luggage is well-stocked and easy to access – In addition to something to read, crossword puzzles or any other forms of entertainment, make sure your traveling senior has their medication and important contact info nearby. An overhead bin may be difficult for them to reach, so think about placing it under the seat in front of them. But make sure it isn’t over-stuffed – if the bag is to big or heavy, that presents other unwanted issues. 4. Plan for downtime and the unexpected – Older loved ones won’t be able to keep up a hectic pace. Make sure there is plenty of time to rest or allow them to sit out some activities. They may miss an event or two, but they’ll be happy for a chance to recharge. In addition, find health care facilities beforehand so if there is an issue, you’ll know where to go. 5. Have Fun – While older loved ones, or those with mobility issues, may not be able to do everything with the rest of the family, they still want to have fun and enjoy their time with everyone. 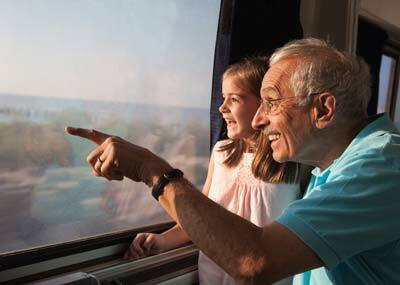 If this is an annual trip, taking time to be with your senior becomes more important with each passing year. As we age, it becomes harder to make travel arrangements. But with a little extra legwork and planning, annual trips with older loved ones can still be a great way to be together during the holidays or at any time of year.